For my foreign readers – Dear all, I have the honor to introduce to you my new poem written in Armenian and titled “The rose’s thorn is its pendant” (written by me on September 29, 2016, 22:35 PM). As always I tried to translate the poem for all my foreign readers. The following is a literal (word for word) translation of the poem, trying to make the meaning of the poem more understandable and available for all. While reading the poem listen to this gorgeous song, entitled “The Power of Love” wonderfully performed by Céline Dion. 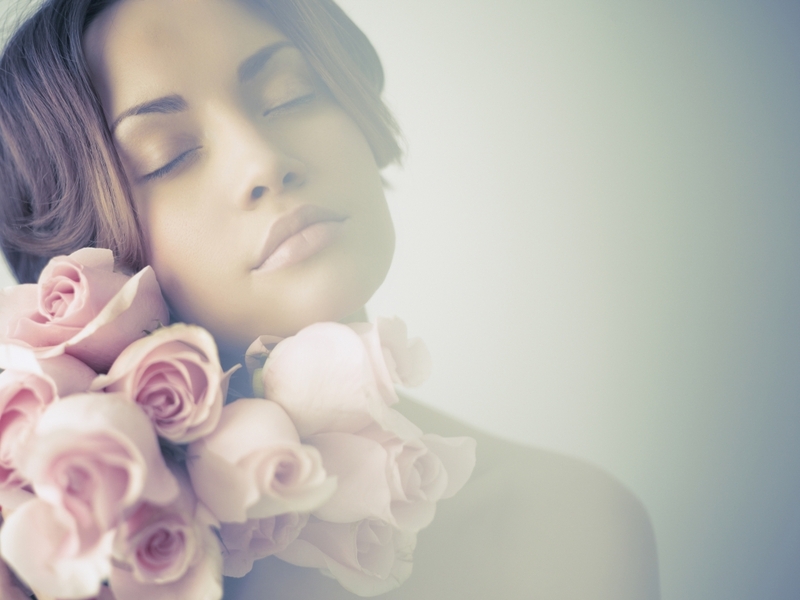 When her loving, tender soul opens as rose. © Author – Arlen Shahverdyan, 29.09.2016. The poem is translated into English by the author. 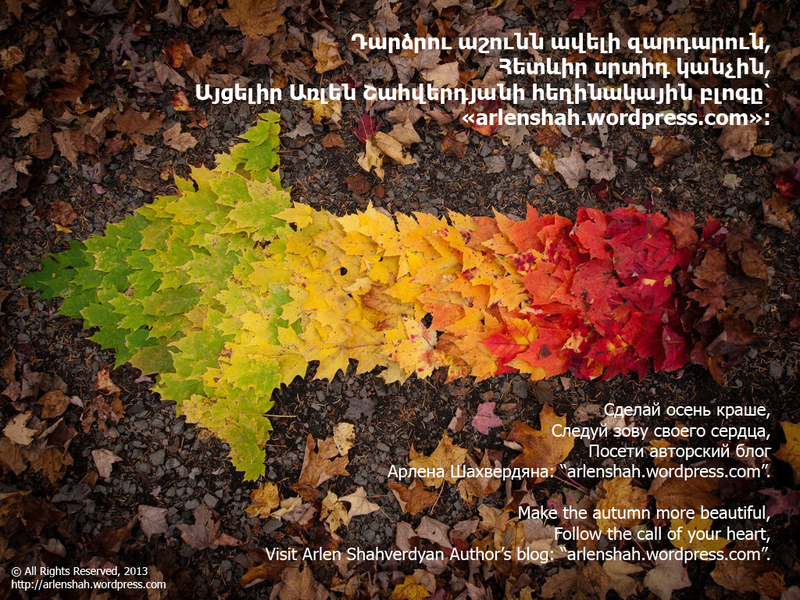 For my foreign readers – Dear all, I have the honor to introduce to you my new poem written in Armenian and titled “It seemed to me, that Autumn…” (written by me October 6, 2015 and September 17, 2016). As always I tried to translate the poem for all my foreign readers. The following is a literal (word for word) translation of the poem, trying to make the meaning of the poem more understandable and available for all. While reading the poem listen to this gorgeous song “The Autumn Leaves” wonderfully performed by Nat King Cole. But this time it was ahead on one flock. © Author – Arlen Shahverdyan, 17.09.2016. The poem is translated into English by the author. For my foreign readers – Dear all, I have the honor to introduce to you my new poem written in Armenian and titled “Tarantella of Love” (written by me on September 8, 2016). As always I tried to translate the poem for all my foreign readers. The following is a literal (word for word) translation of the poem, trying to make the meaning of the poem more understandable and available for all. While reading the poem listen to this gorgeous Italian music – Tarantella. 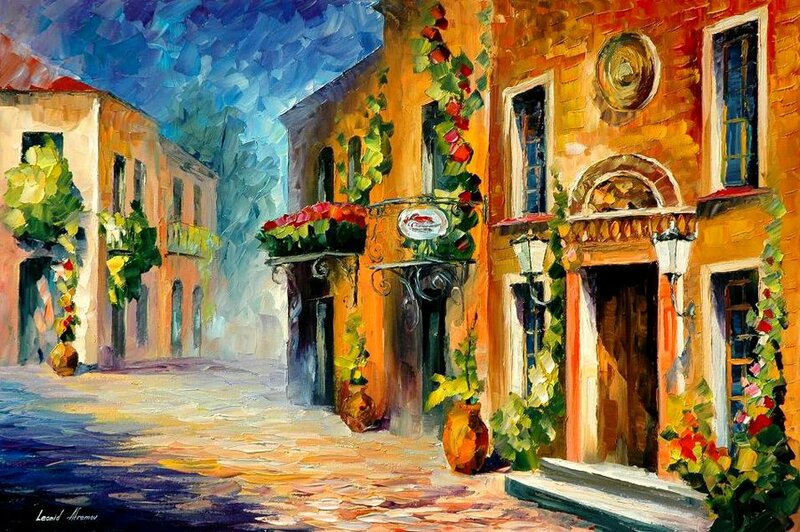 It is my pleasure to introduce to you this two photos of Italian and Sicilian city scenes drawn by Leonid Afremov. Who is going down the street now? Who is slowly approaching me? Who paint with bright colors every minute of my life? Who fills the garden, the forest and the river with light and pure melody? 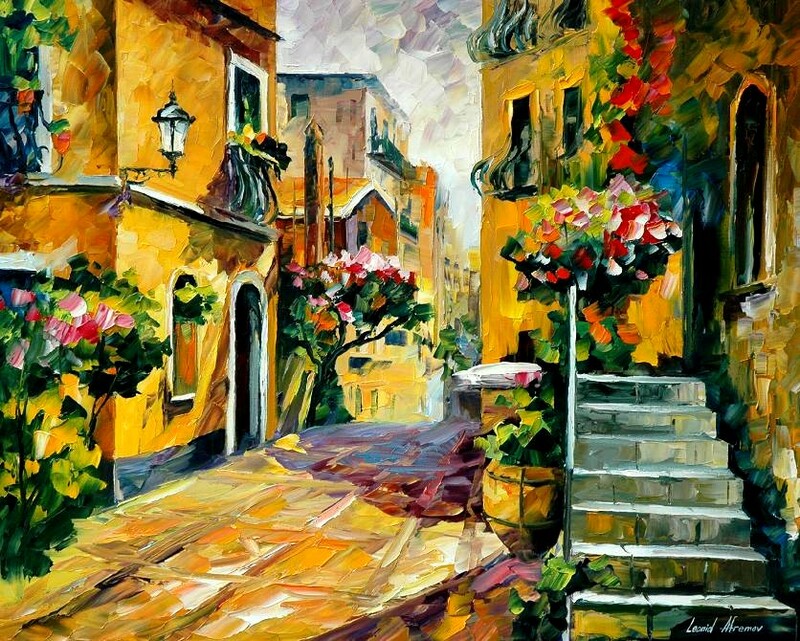 Who is opening a trail of love in the heart of the old city? Who is bringing with her spring to all the groves and gardens of this city? By whom now there are playing the guitars and the tambourine? Playing taratella and mixing arond me the old and the new. Whos brings feast around with her lughtful, swett face? In the big garden of the city, on the trail filled with love. © Author – Arlen Shahverdyan, 08.09.2016. The poem is translated into English by the author.